Earth Day is a great opportunity to talk to students about the Earth and caring for the world around them. Enjoy this curated list of 20 Earth Day Crafts for Kids, perfect for any elementary-aged classroom. Papier-Mâché Globe – Celebrate Columbus Day with this handmade globe! Old Bottles, New Buddies: Cute Upcycled Planters for Kids – With this craft you’ll be creating characters by upcycling different reusable items. It’s a total blast! Earth Slime Lorax Activity for Science and Earth Day Activities – A super fun Earth slime Lorax activity for Earth Day! Who doesn’t love homemade slime? Super simple and super fun! Earth Day Craft For Kids – This paper plate craft is a really fun and simple way to teach kiddos about the planet! Soda Bottle Lion Craft – another fun craft with a recycled soda bottle, this adorable lion craft is sure to be fun one! Make an Earth Day Craft Preschoolers Will Love Together to Celebrate – Super cute and simple Earth Day craft for the littles! This is surely one that will be kept for years to come! DIY Mini Art Book – Using upcycled paper bags, kids have a blank canvas to create these fun DIY mini art books with just a few folds and cuts! Recycled Cork Boats – A fun recycled craft using just a few simple supplies! Earth Q-Tip Painting (Free Printable) – this is a great fine motor activity for little ones! It’s a great way to spark up chatter about geography, science, and nature! Shaving Cream Marbled Earth Day Kids Craft – Ahhhh, painting with shaving cream is SUCH a fun activity to do! Kids will have a blast creating this super fun Marbled Earth craft! Grass Crowns for Earth Day – a fun and quick crown grass craft that will be a blast to make. It’s super simple and just needs a few supplies to make! Earth Day Kids Activity: Suncatcher – Who doesn’t love a sweet suncatcher craft? Find out how to make an Earth Day suncatcher with just a few supplies! Easy Toilet Paper Roll Bird Feeder – This is a fun craft that keeps on giving! Kids will have a blast watching the birds enjoy this crafty treat! Watering Can Earth Day Craft – a fun upcycled craft to help keep the plants watered! Dirt Cups Recipe – a yummy snack that can be used as a fun hands-on activity for the kids to pull together! And the, they get to enjoy their tasty dirt cup creations for a snack! Egg Carton Tree – a fun way to reuse those egg cartons and create an Earth Day inspired craft with recycled items! How To Plant Seeds With Kids – This is a super fun hands on activity on teaching kids how to plant seeds. Plus – they’ll get to water them and watch them grow! Earth Luminary – and adorable craft that’s sure to stay around for a long time! Pasta World Map – a great way to talk about geography, Earth Day, and enjoy some crafting time! 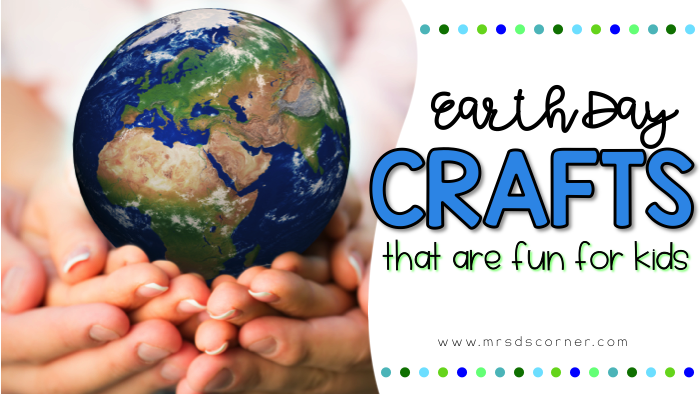 What crafts do you like to do with your students for Earth Day?